Three’s company! Shake Shack’s setting up shop in Kierland Commons, the premier lifestyle and shopping center situated on the border of Scottsdale and Northeast Phoenix. The Kierland Commons Shack opens its doors on Thursday, September 15th at 11AM, and will be the third Shack in Arizona along with the Fashion Square Shack in Scottsdale and the Uptown Plaza Shack in Phoenix. The Shack is situated right in the heart of Kierland Commons, a natural gathering spot harkening back to our roots in Madison Square Park. Guests can kick back on the outdoor Shack patio and sip on a selection of hand-picked wine and ice cold local craft beer from Huss Brewing Company, SanTan Brewing Company and Phoenix Ale Brewery in addition to the Shack-exclusive Shack Red® and Shack White® wine from Frog’s Leap Winery and ShackMeister® Ale from Brooklyn Brewery. In addition to the Shack classics, the menu will feature Arizona-specific frozen custard concretes, including the CamelShack (vanilla custard, salted caramel sauce and slice of banana cream pie from our local buds at The Bakery Phx) and Peanut Butter Toffee Crunch (vanilla and chocolate custard, peanut butter sauce and chocolate toffee). Spun exclusively at the Kierland Commons Shack, the Kierland Campfire concrete is chocolate custard, marshmallow sauce, graham cracker and Scottsdale’s family-owned Zak’s Chocolate dark chocolate chunks. As part of Shake Shack’s mission to Stand For Something Good®, Shake Shack will donate five percent of sales from the Kierland Campfire concrete to support the Arizona Humane Society, committed to improving the lives of animals. Shack team members will also volunteer at events run by the organization. In keeping with Shake Shack’s commitment to thoughtful, well-crafted and responsible design, the Kierland Commons Shack’s tabletops are made from reclaimed bowling alley lanes by CounterEvolution and chairs are designed by Uhuru using ash wood from sustainable forests. Booths are crafted by Staach using lumber certified by the Forestry Stewardship Council. Additionally, the interior walls of the Shack are clad in reclaimed local mushroom and tobacco wood. Shake Shack is a modern day “roadside” burger stand known for its 100% all-natural Angus beef burgers and flat-top Vienna beef dogs (no added hormones and no antibiotics ever), 100% all-natural cage-free chicken (no antibiotics ever), spun-fresh frozen custard, crinkle cut fries, craft beer and wine (available at select locations) and more. 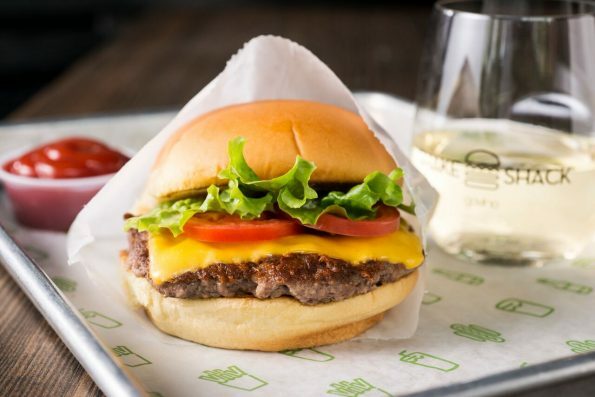 With its fresh, simple, high-quality food at a great value, Shake Shack is a fun and lively community gathering place with widespread appeal. From its premium ingredients and caring hiring practices to its inspiring designs and deep community investment, Shake Shack’s mission is to Stand For Something Good®. 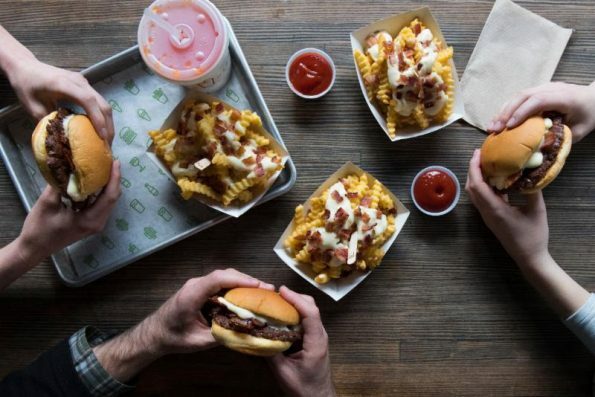 Since the original Shack opened in 2004 in NYC’s Madison Square Park, the company has opened multiple locations in 15 states and the District of Columbia, as well as international locations including London, Istanbul, Dubai, Tokyo, Moscow and more.